Kitty Bingo is a mid-sized online bingo site, and whilst it may not be one of the most famous, this B-Live gaming site has proved popular with its players and has managed to amass a significant number of regulars; so all the games offered at the site are lucrative and fun. While the site doesn’t quite match up to some of its competitors in terms of the actual games on offer, some of their additional site features more than make up for it. Furthermore, a fantastic loyalty program is offered along with some great side games, so you will still enjoy a high quality, premium bingo experience at all times. We’re going to start by taking a look at the bingo games and halls available at Kitty Bingo, so let’s get started. Kitty Bingo offers a healthy number of bingo rooms, and whether it’s 90-ball bingo you’re looking for or 75-ball game variants, you’ll find an array of choice from the main ‘Bingo’ menu. One of our favourite rooms is the ‘Free Play’ room. Open to all players and running from 10AM GMT onwards, the free play room allows you to play completely free bingo games with no ticket purchase required. Of course, the prizes are quite a lot smaller than if you were you paying, but it’s a great way to familiarise yourself with the site and gain some real-life bingo experience; not to mention being ideal for those on a tight budget. Some of the regular games that run at Kitty Bingo include Kitty Cat, Penny Heaven, Fat Cat and Newbie. Kitty Bingo offers two main categories in their ‘Side Games’ area: Casino Table Games and Slots. Unfortunately, the casino game range is a little underwhelming and there are just a couple of games, including Roulette and Blackjack. Thankfully, however, the slot section is far more diverse, and with over 80 slot games to choose from, you’ll always be able to find something to fill those spare few minutes while you are waiting for a new bingo game to begin. There are a number of Microgaming titles, including: OMG! Kittens, Jazz Cat, Dragonz, Immortal Romance, Thunderstruck II and Game of Thrones 243 ways to win. You will also find some IGT games including Kitty Glitter and more. 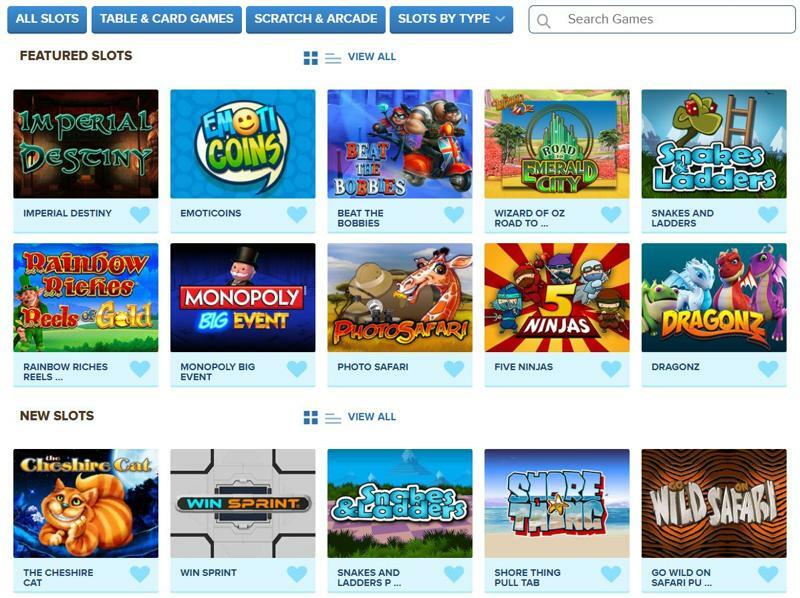 Perhaps most interesting, though, is the addition of slots exclusive to Kitty Bingo, including titles such as Groovy Revolution and Cash Diner. You can find these games nestled among the main slots section, so you’ll always have a complete overview of what’s on offer. The Kitty Loyalty Club is where the site really stands out from the crowd. There are five different tiers that you can become a part of depending on how often you play on the site: Bronze, Silver, Gold, Ruby and Emerald. There’s no opt-in required to begin accumulating points in the loyalty scheme, and each time you play one of the side games or purchase a bingo ticket, you’ll be awarded a number of points. 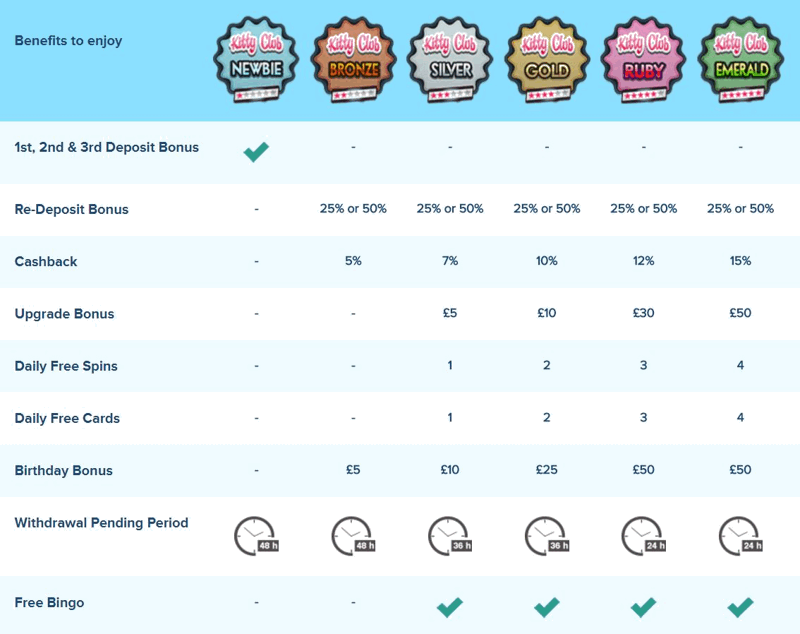 The higher your loyalty level, the more points you get per £1 staked, and these points can then be exchanged for cash credit from the bonus store. Note: 1,000 loyalty points converts to £1 of bonus cash. Terms and conditions are attached so be sure to check out the full terms, you can find these on the ‘Promotions’ tab which is just one click away from the main homepage. Kitty Bingo offers a great selection of deposit and withdrawal options for you to use, and whether you want to keep it simple with a Debit/Credit card or you would prefer to use one of the many EWallets available, the site ensures all players can find a deposit and withdrawal option that suits them. The vast majority of cards are accepted, including VISA, MasterCard and Maestro; and the EWallets you can use include Neteller and PayPal. Paysafecard is also an option, and in certain circumstances you can even request to use a cheque or bank transfer, but this isn’t commonplace and requires pre-authorisation from the bingo site first. Note: Kitty Bingo enforces a strict deposit = withdrawal policy, which means you must withdraw using the same method you used to deposit. The only exception for this is MasterCard. Withdrawals typically take around 2 days, although on bank holidays and at weekends it could take up to 3 working days.